Dustin Kelley drives a bulldozer atop a three-story Gorham Sand and Gravel snow dump on Commercial Street in Portland on Wednesday, March 14, 2018. Steve Stuart, in the company office, estimated the pile at something like 100,000 square yards of snow. 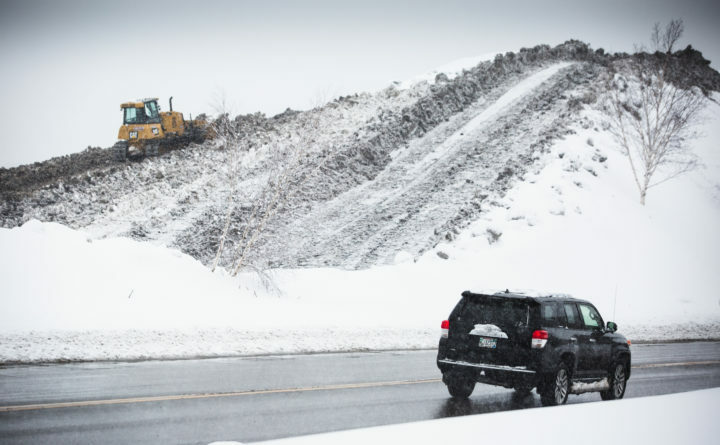 A two-day nor’easter began dropping snow over southern Maine mid-morning Tuesday, kicking off the storm that dropped as much as 24 inches of snow over parts of the state. See which communities have reported the most snowfall statewide in the chart below. Check back throughout the day for the latest snowfall totals reported to the National Weather Service offices in Gray and Caribou.